Designed and manufactured in America, this elegant pant hanger sleek rectangular design and stylish metal clips are suitable for men’s and ladies trousers, as well as skirts. The strong reinforced plastic body with enhanced manufactured properties will elegantly display your article of clothing. Contoured plastic body with reinforced cross sections add exceptional strength to this hanger. Metal bar fetaures two sliding clips with rubber padding to protect those delicate garments. The hangers metal components are nicely contoured to display excellent presentation properties as well as a nice chrome polish finish. 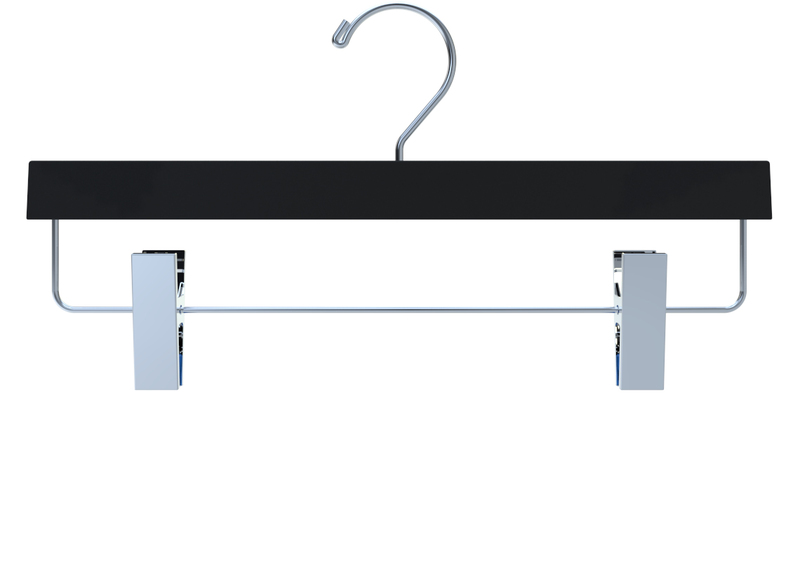 Our boutique pant hanger is not another typical hanger. Designed and manufactured in the USA. Get to know our company and our exceptional line of hangers. I own a small boutique that sells high end denim jeans and these hangers are great. They are very strong and can hold the jeans securely. And I love that we can get our logo printed on them. We love this style of hanger. I love how it enhances the look of our clothes in our retail enviroment. Another great feature is that we can get our logo printed on this hanger. I was looking for a unique look for this one space I was working on. I was having lots of issues find the right hanger in the right color and of course a tight schedule demanded that we needed to work fast. In the end, my client was very happy with the result. I was having such a hard time finding a reliable source for plastic hangers. Many of the hangers in the market today do not even come close to the quality of this hanger, and it is also made in the usa.